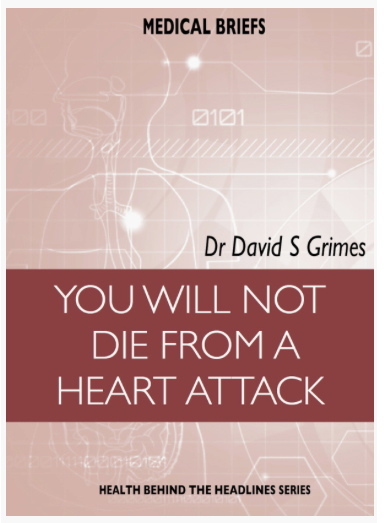 Few people are aware that coronary heart disease (CHD) has been an epidemic of the latter half of the 20th century. It is now almost over. Although there were case reports in the early years of the 20th century, the onset of the epidemic was in about 1924 with an exponential increase leading to a peak in 1970. The emergence of the epidemic was described clearly by Dr Maurice Campbell of Guys Hospital. He was one of the leading cardiologists in the UK in the post-war years and he was respected for his careful data collection and interpretation. There became a major public health problem. There had been important heart diseases before the emergence of the CHD epidemic - rheumatic heart disease (following rheumatic fever earlier in life), syphilitic heart disease (usually following sexual indiscretion earlier in life), and endocarditis, an infection of heart valves usually complicating rheumatic heart disease. But rather than total heart disease deaths diminishing, the total increased as a result of the new widespread disease of the coronary arteries. At the peak of the epidemic in 1970 there were 520 deaths per 100,000 per year in England and Wales, 700 in the USA, and an astounding 960 in men in the West of Scotland, the world's highest incidence. Thereafter there was an abrupt and apparently spontaneous decline, by 83% during the next 20 years to 1990. This is an important observation as during this time there was no widespread effective medical intervention. As the epidemic occurred in all continents simultaneously (with the exception of the tropics) it should be regarded as a pandemic. The decline continues. At present the death rate is about 20 per 100,000 per year and the decline appears to continue. As a result of the rapid decline of CHD deaths, average life expectancy has increased and we now experience a rapid increase in the number of elderly. We appear to have experienced a natural epidemic and it is now almost over. The cause of it has not been obvious, but when we realise that CHD has been an epidemic we can start to think objectively about what might have caused it. Maurice Campbell: first editor of Heart. Silverman ME. Heart. 2003 Dec;89(12):1379-81. Campbell M. Death rates from diseases of the heart: 1876 to 1959. Brit Med J 1963; ii: 528-35. Campbell M. The main cause of increased death rate from diseases of the heart: 1920-1959. Brit Med J 1963; ii: 712-7. Florey C de V, Melia RJW, Darby SC. Changing mortality from ischaemic heart disease in Great Britain 1968-76. Brit Med J 1978; i: 635-7. Stamler J. The marked decline in coronary heart disease mortality rates in the United States, 1968-1981; summary of findings and possible explanations. Cardiology 1985; 72: 11-22. UK Department of Health. The National Service Framework for Coronary Heart Disease: Winning the War on Heart Disease. The Stationary Office: London 2004. Grimes DS. An epidemic of coronary heart disease. Quart J Med 2012; 105: 09-18. 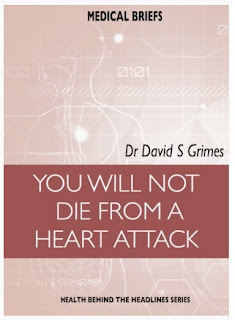 Grimes DS eBook – You will not die from a heart attack. Hospitals in India are famous and well-known hospital and patients come here from all athwart the world for treatment. A good hospital in India always helps patients to cure diseases which are more or less incurable as per their local doctors and hospitals. And you are too kind and don't observe that government, health services and statin manufacturers take false credit for it! So I found your 2012 article with keyword search. Amazing (IMO) that they can't figure this out ! 1930 online yearbook, why can't we get that from bigger countries ? They should have done it long ago. Hi - The 1963 BMJ papers by Maurice Campbell (a very highly respected UK cardiologist) are very clear. 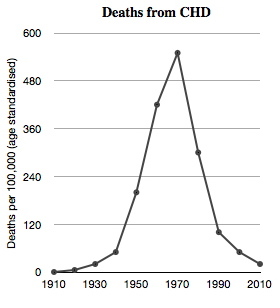 CHD emerged in significant numbers in about 1924 and beforehand there were just case reports. I agree with your thoughts about the 1918 epidemic of "flu": could this have been the micro-organism that triggered the CHD epidemic? This means that we are dealing with a cohort effect: people born in the late 19th and early 20th centuries would have been exposed to the micro-organism, and then passed in on to their children (non-genetic inheritance). Later generations would have benefited from inherited immunity and so the epidemic came to an end. It is a simple view that fits in with the observations. I found some papers about the flu-CHD connection, but they didn't make so much sense to me. We have shortterm effects during a flu wave, i.e. H3-waves, but maybe also different longterm effects ?!. in 20th century mortality. Some researchers relate it to immunity problems. - Just an idea, from what I read - I'm not a medical person (programmer). 1924 is the supposed start in England ? I'd make it 1920 in USA. A "heart attack" (myocardial infarction, MI) is an event. The underlying coronary heart disease (CHD) is a chronic disease starting off perhaps as early as late childhood, with a sub-clinical latent process of several decades before an MI occurs. Very nice post. Thank you so much for sharing with us. can you suggest me the best hospitals online in India for bariatric surgery?